As mom to a 4 year-old- girl, my only choice for favorite movie this season is Frozen. We’ve seen it twice and the soundtrack is on repeat constantly (not a terrible thing given the presence of Idina Menzel). In everything, though, there is a lesson if we are looking for it. I can see in this movie a beautiful analogy for relationships in the multi-ethnic church. In Frozen, Queen Elsa has the power to create snow and ice. When Elsa is afraid, her winter creations are jagged, contorted crystals. As her fear melts away, she instead produces happy snowmen, shimmering staircases, and ornate ice castles. In our racially reconciling church, I see again and again how fear distorts our best efforts at relationship. For example, my husband recently posted what he thought was an innocuous status on Facebook. “I've noticed that when it snows, high income neighborhoods get cleared immediately low income neighborhoods do not get cleared. Why I don't know.” Thirty-two emotional comments later, he learned that such an observation means different things for different people! Many felt my husband was trying to make them feel guilty for having plowed streets while others went without. In reality, there was no intent of the sort- as one commenter rightly mentioned, we live in a neighborhood where the streets are plowed before it even stops snowing. Still, we learned that fear of being made feel guilty caused even people who had been over to our home for dinner to react strongly. Fear is hard to admit and recognize because it is a charged emotion that takes so many forms. To identify whether fear is playing a role in your multi-ethnic relationships, check out these three statements below typically associated with fear. 1. I hate being uncomfortable- This is the starting position to those who are new to the multi-ethnic church or to deep relationships with diverse others (racially, ethnically or socio-economically). Starting here is perfectly natural, but staying here will end our efforts at unity before they start! Sociologically, “religious groups exist to supply members with meaning, belonging, and security.” These factors tend to be greater amongst a group of people with similar characteristics, and so homogeneous congregations feel more comfortable. This is because our political leanings, lifestyle and even worldview are less likely to be challenged in a group that looks and lives like us. However, in order to display the unity Christ called for in John 17, we have to get comfortable with being uncomfortable, and even with having others being uncomfortable. A younger African American who offended an older African American by not offering a proper greeting on Sunday morning. We bring into every interaction our own cultural norms. When these come into contact with the norms of others, offense may very well result until we come to understand each other. When not addressed constructively, this offense can tear apart old relationships and make us afraid to begin new ones. 3. I don’t want to feel guilty (admit that I have privilege)- This may be one of the trickiest fears to deal with. Especially for majority or socio-economically advantaged populations, coming into contact with diverse others may mean confronting advantages others don’t have. When you build diverse relationships you will get to know the boomer adult who can’t find a job, the better qualified woman who was passed over for promotion in favor of a man, the ambitious teen stuck in a terrible school or even the person with unplowed streets who can’t get to work. As we see disadvantages others face, our narratives about success and life will be challenged. This is a scary prospect that can push us back into the comfort of homogeneous relationships. The Solution: So what do we do when we recognize these 3 fears subverting our cross-cultural relationships? In Frozen, as well as in our relationships, the answer is love! Love is the opposite of fear, because while fear focuses on self-preservation, love values the other as primary. Just as Christ loved us enough to face the fear of Gethsemane to mount the cross of Calvary, so we must become self-forgetful to build a bridge of reconciliation for others. When I step out of fear and into love, I am willing to be uncomfortable, challenged, and even hurt if only the object of my love can have their needs met. When we try to enter into multi-ethnic relationships but still harbor the above fears, it won’t be long before our efforts become twisted. Through love, however, we stay in relationship through the difficult bits. We work at relating across divides. We grow to love and value others for who they are. We build the bride of Christ across every fracture of human origin. And why is it worth it to face my fears? We grow as Christ followers when we open our hearts to other perspectives- God is infinite and the cultural perspectives of every Christ-follower have something to contribute to our understanding of Him. 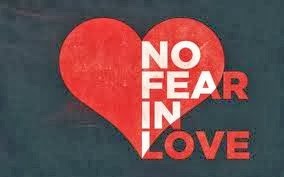 So this week, consider if fear has been a factor in your relationships and step out of it into love! You can do this by following the advice of Philippians 2:3- to value others, even at your own expense. You will likely find a beautiful creation, a new shoot of the church like heaven, springing forth from your efforts and you will be richly blessed.